The VPG Transducers brand of Vishay Precision Group, Inc. (NYSE: VPG), global designers and manufacturers of standard and custom force, pressure, torque, load, tension and weight sensors, today announced the introduction of its W Series. 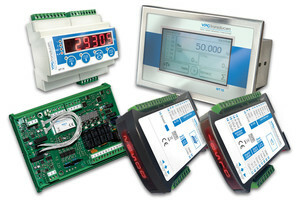 The new W Series offers four models of weighing indicators for DIN-rail and panel mounting, with interfacing ranging from entry level to advanced, plus options for output, display and interactive functionality. The W Series also includes the WG3 electronic overload guard, a compact, redundant safeguarding system designed to prevent weighing machine overload. These products expand the existing range of VPG Transducers weight indicators, providing more selection and options to meet cost and performance requirements. The W Series support a broad range of industrial process and batch weighing applications across industries such as agricultural equipment, packaging, construction, and more. The WT1 Weight Indicator is a cost-effective DIN rail indicator with a 5-digit display that provides accurate readings, high performance, and long-term reliability. The instrument is able to interface with intrinsically safe barriers, enabling its use in hazardous areas. When connected to a system of 1–4 load cells, the WT1 converts output signals into stable, accurate weight values. Equipped with two logic outputs and two logic inputs as standard, the WT1 can be fitted with either an RS232C half-duplex or RS485 full duplex serial door; both serial doors can be loaded with ASCII or Modbus RTU protocols to enable communication with a PC or PLC. The WT2 has the same features as the WT1, but offers improved interfacing capabilities. Its connectivity strength comes from using PROFIBUS as its default protocol, which enables more control in more complex systems. The WT2 also features an optional Ethernet connection, which comes with a 128-byte in/out buffer for high-speed PC connections. The compact dimensions of the WT1 and WT2 make them an ideal choice for electrical panel automation applications. The WT14 weighing indicator features expanded storage capability and a 6-digit, 7 segment, LED display plus a four-key capacitive keyboard for easy access to the configuration and calibration functions.. The model is equipped with RS232 and RS485 serial ports and a USB device port as standard It includes an internal data logger function for onboard memory and an external function for monitoring the performance of the weighing system. Options allow interfacing with the most widely used fieldbus options on the market, which include PROFINET, DeviceNet, Ethernet (10 to 100 Mbps), Ethernet IP and EtherCAT. The WT15 is a high-quality weighing indicator equipped with an LCD screen with capacitive touch controls, multi-lingual menu and an ARM Cortex-M0 microcontroller, which offers a 32-bit code density to provide impressive computing power in a compact size. The WT15 indicator features six opto-isolated input and six output ports – the most logic ports of any VPG Transducers indicator. The WT15 is appropriate for desk, wall or panel mounting and is suitable for a wide range of industrial and commercial applications. This model is available with an ATEX certification option, for use in explosive environments. The WT14 & WT15 have a frequency acquisition AC/DC signal of up to 1000 Hz and a display resolution of 999.999 divisions. The two models have several connection combinations: the WT15 has 10 different output combinations; the WT14 has 12, making them highly adaptable machines due to the number of output options. The WG3 electronic overload guard is a redundant safeguarding system with two independent inputs for load cells, a load limiter with a double security design and an integrated alarm for load cell malfunction or power failure. It is designed to prevent a weight bearing machine from exceeding its capacity, thus preventing accidents in industrial settings. The device meets category 3 EN 13849-1:2008, PL d standard requirements and is ideal for application in off-highway vehicles, agricultural equipment, and construction. For detailed specifications, pricing, applications engineering support, or additional information, please visit www.vpgtransducers.com.